Daniel De Leon is an accomplished Los Angeles based 3D artist with an increasingly impressive resumé. 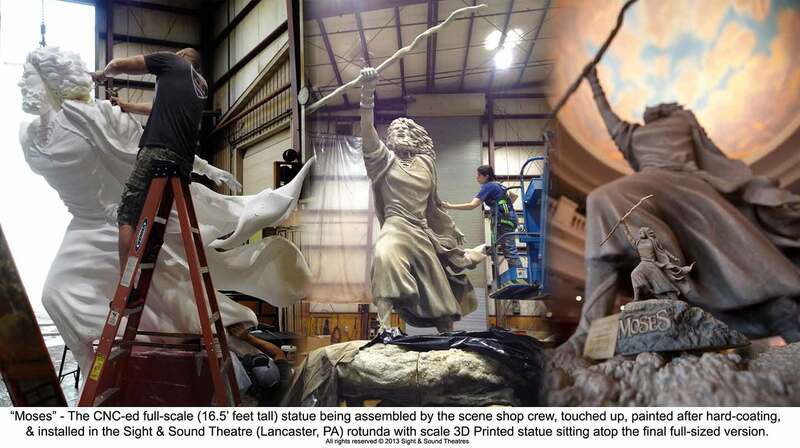 His work can be seen in the form of larger than life statues such as a 16 foot tall statue of Moses standing in Sight & Sound Theatre in Lancaster, PA and most recently, the official Dropbox mascot residing in their corporate headquarters, a giant chrome panda, which he designed. 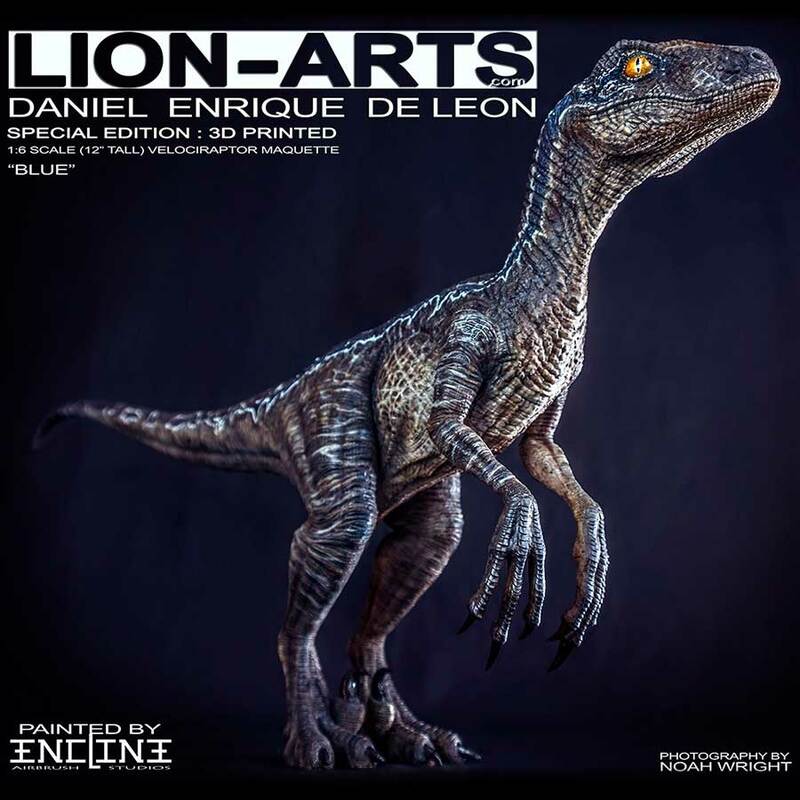 With accomplishments like these as well as the popularity of his Jurassic World raptor collectible among many others, we’re sure to be seeing more of Daniel’s work in the public eye. In addition to his professional achievements, Daniel will also have a course available through the Gnomon School of Visual Effects: "Mastering Desktop 3D Printing for the 3D Artist" available January 2017. How did you come to be involved with the Panda project? 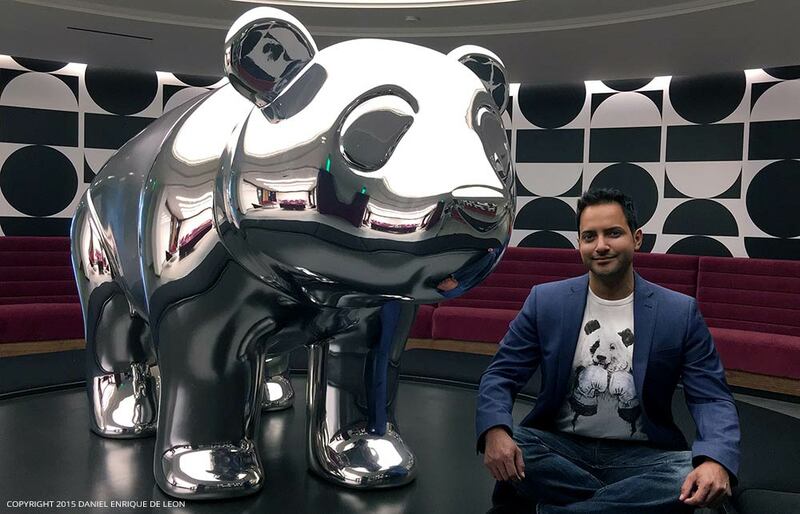 During the Christmas season of 2015, my friend Leon Wood, a talented designer at Rapt Studio contacted me asking if I would be interested in designing Dropbox's new mascot: A giant panda statue. 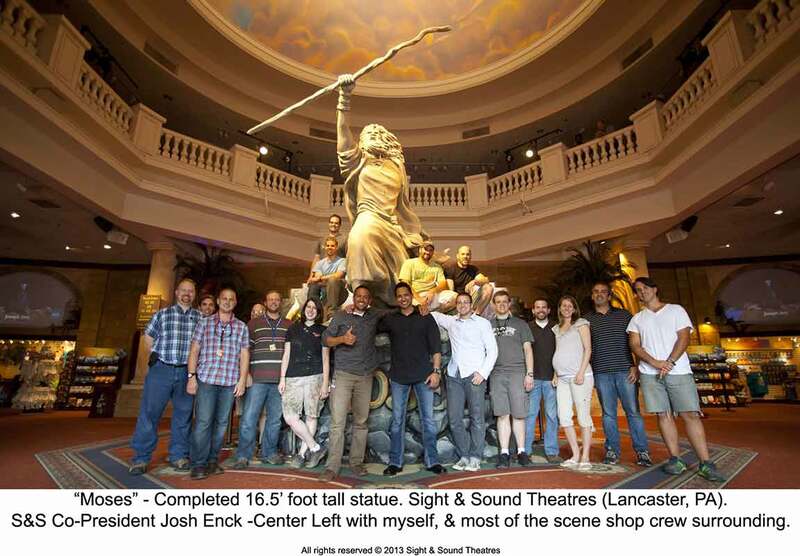 Leon knew of my past volume of work in designing and digitally sculpting complex characters, sets and props for larger-than-life-sized fabrication at Sight & Sound Theaters. Coupled with the fact that I'm a huge animal lover and enjoy modeling animals/creatures more than anything, I said “Yes, please!" and leapt at the opportunity coming on board as Lead Designer and 3D Artist. Leon served as my art director and liaison to the Dropbox team in collaboration with Glara Ahn, Dropbox’s Space Design Lead on the project. Together, they provided the direction and guidelines I needed to get started on the Panda's simplistic, cute and fun design. What, if any, direction were you given for the Panda? I was given a simple, inspiration/design board featuring images of works by the likes of artists such as: Koons, (Metallic balloon dog ), KAWS (Giant wood characters) and Pompon (Stone Polar Bear) as references for the general aesthetic Dropbox was going for. With those few images and a quick sketch of my own, I went straight into ZBrush to begin figuring out the mascot’s form. Dropbox's direction was they wanted realistic proportions, a very simplified silhouette, and a clean form; a general blending of all the images provided on the design board. 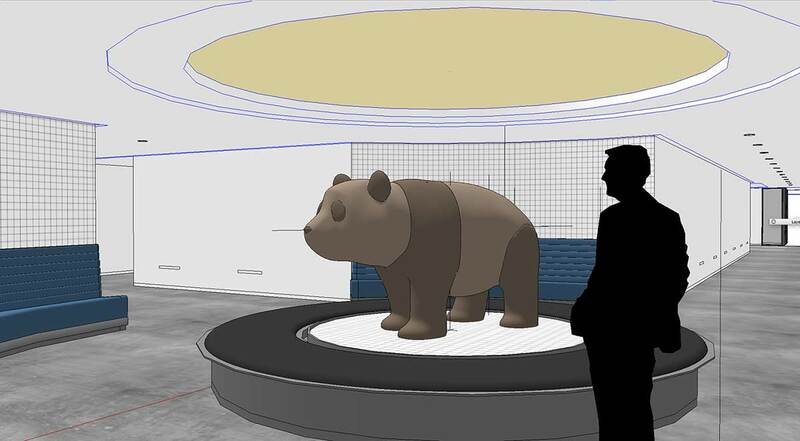 What was your process for the creation of the model? 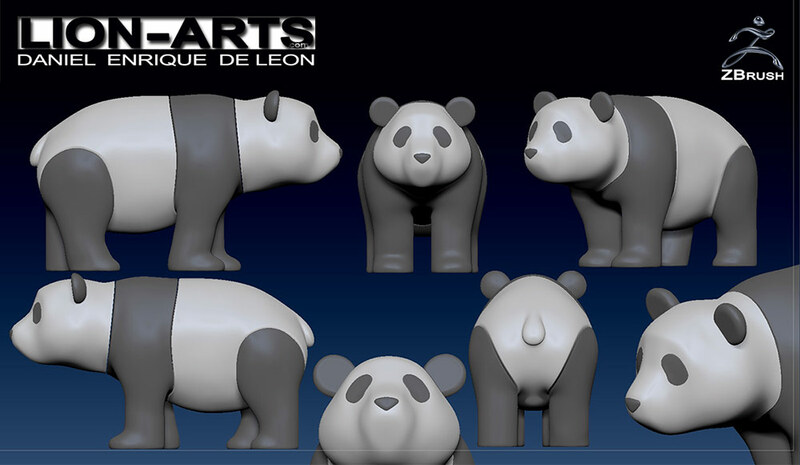 The process of designing the panda within ZBrush was fairly straightforward. 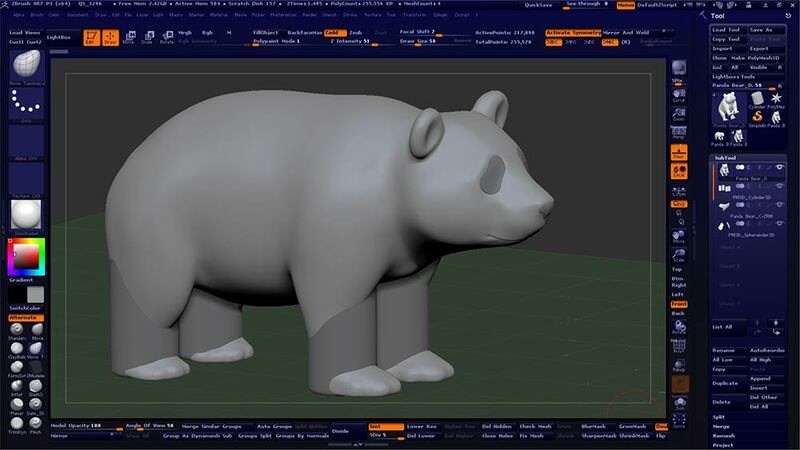 I created a quick and clean low-poly mesh using the ZModeler Brush, then subdivided up to achieve the smooth flow of its silhouette, followed by using the CurveSlice Brush to section the model into separate parts/subtools that were representative of the black and white areas of a real panda's fur coloration. 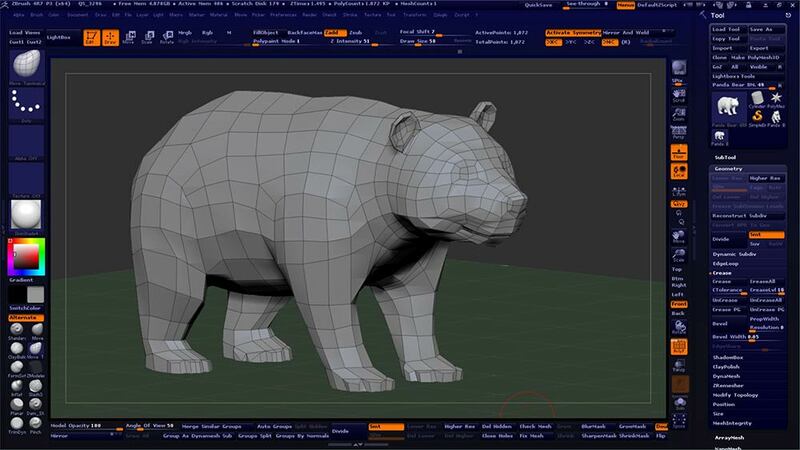 I added simple separate subtools, sculpted into the shapes around the eyes, and the form of its nose. How many revisions were required to reach the final product? 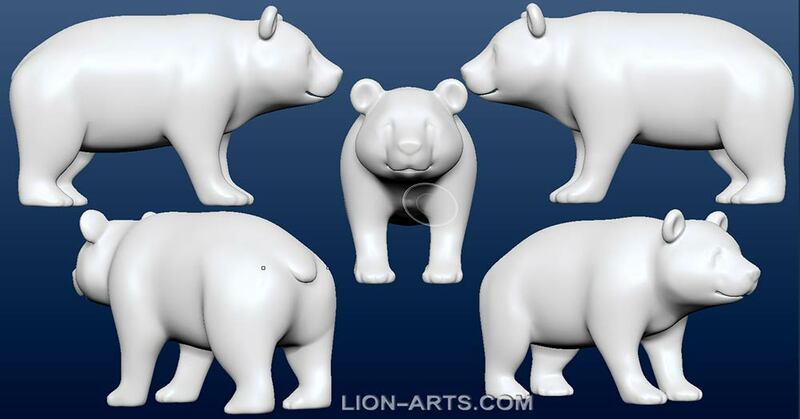 Once I showed the team turnarounds of the first form in ZBrush, only 2 or 3 minor form revisions were asked of me, with only slight changes made here and there to bring it to a point they were happy with. 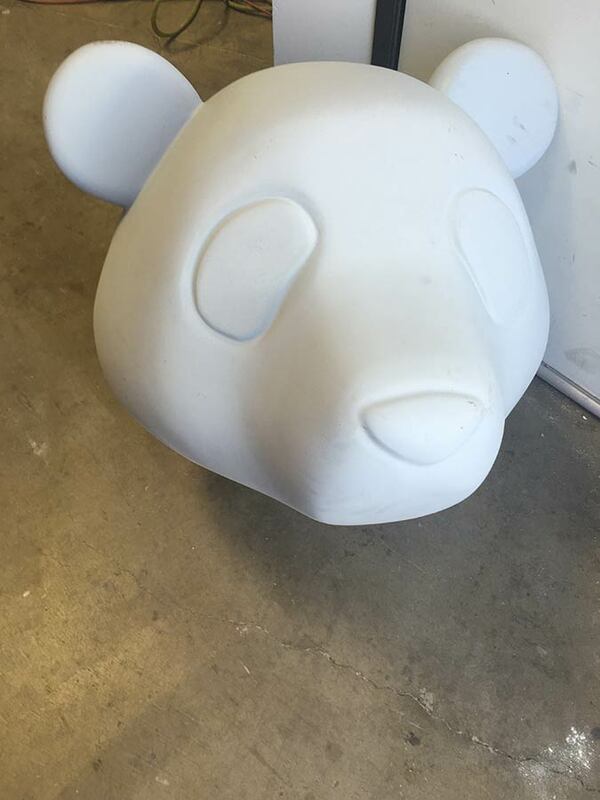 Those slight changes being: which parts would be kept separate for tonal/material differences to show the delineation between the black and white areas of fur normally seen on a panda. 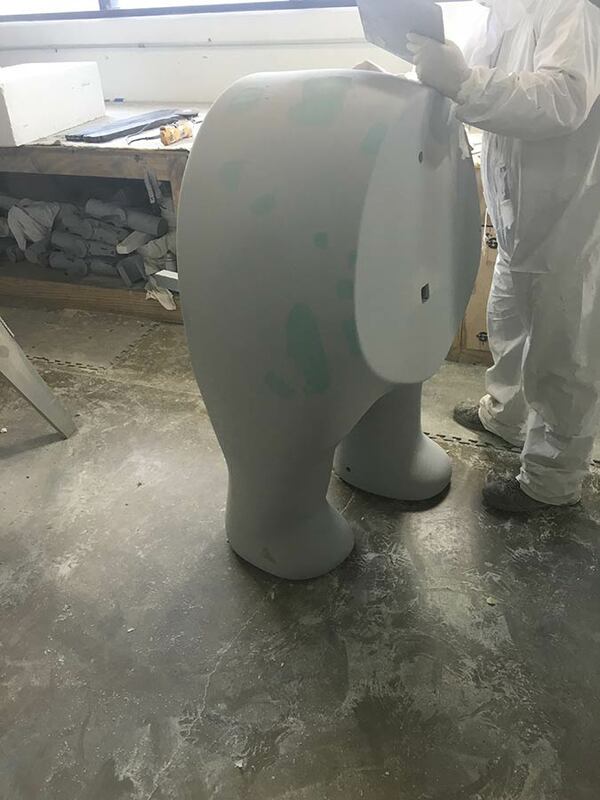 The biggest change in the whole project wasn't to the shape of the 3D Model of the Panda, but the original choice of the material it would be physically fabricated from. Once the form was finalized, I would submit realistic renders of what the panda would look like with the material being considered. 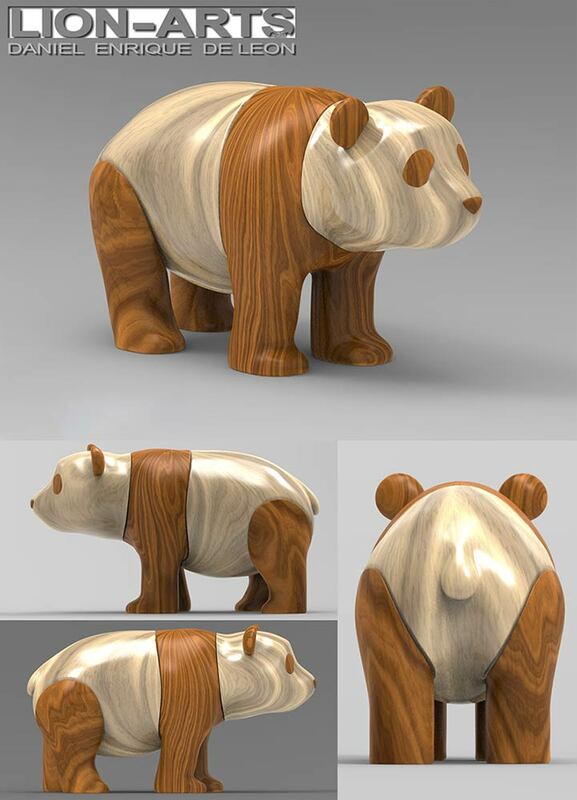 Originally, and for the vast majority of the digital pre-production phase of the project, Dropbox wanted the panda to be made of fine, beautiful real woods (Walnut and White Oak) for the black and white parts respectively, but once the quote for fabricating the panda out of wood was given, it approached the $1M mark, far surpassing Dropbox's budget. So the team began looking at alternative materials and methods. A chrome finish was suggested and I provided a render, which locked in the new, final look they wanted and also allowed for a much more cost effective way of producing it, coming in far below the widely misreported $100k price tag. How was the model finally brought from the digital world to the real world? 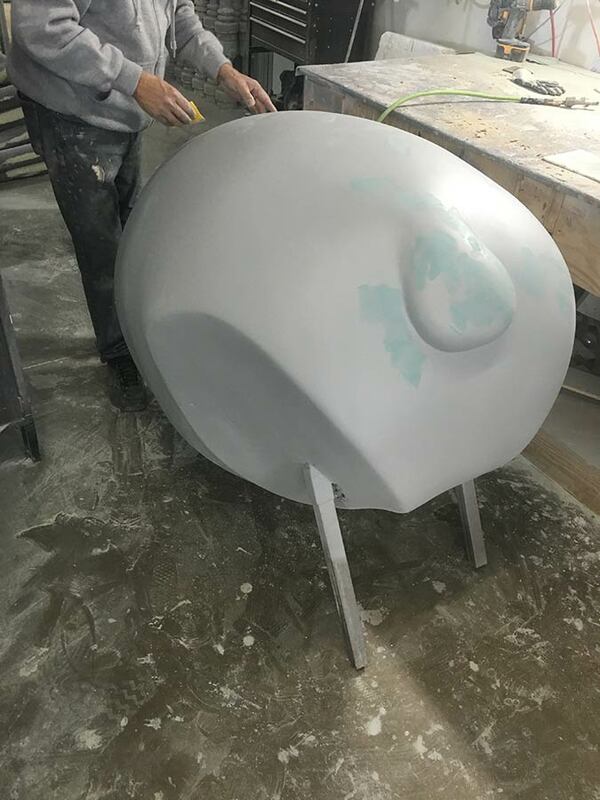 Much like the giant sets, props, and statues I designed and sculpted for Sight & Sound Theaters, the Panda wound up going through a very similar fabrication process. 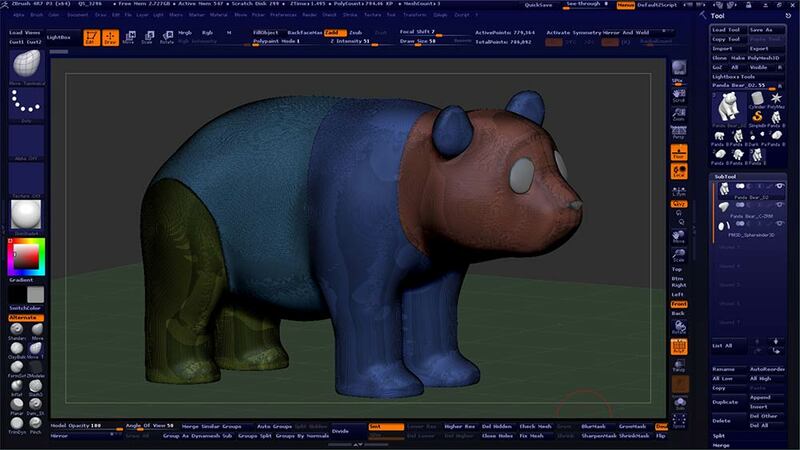 I exported the 3D files in the format they requested, they imported those files into software for a CNC machine to mill the panda's parts out of high-density foam, coated those parts in resin, used a clean room to sand and polish the resin to an extremely smooth finish, then finally used a vacuum form metalizing process to give the panda it's authentic chrome finish, coming in well under budget (and its widely purported cost).